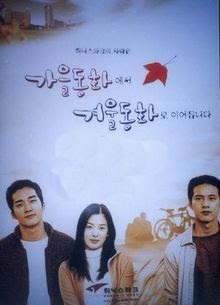 This is the first KDrama I watched (as far as I can remember), and at the end of it, I sorta decided not to watch another ever again. Why? It broke my heart to see Jenny (Song Hye Kyo) die and then Johnny (Song Seung Hun) commits suicide. I was really depressed for a while. But my resolution was immediately broken and even had a 360 degree turn, I became addicted to KDramas and other Asian Dramas so to speak. Autumn Tale is one the Endless Love series together with Winter Sonata, Summer Scent and Spring Waltz. Yoon Joon-suh and Yoon Eun-suh grew up as siblings but Eun-suh was in fact from a different family as there was a mixed up at the hospital where she was borned.The switch came to light when Eun-suh was involved in a car accident and it was discovered that her blood type was different from her parents. Eun-suh's life took a complete turn when the 2 girls were returned to their respective families. Soon after, the Yoon family left for the States and Eun-suh was left living in sordid condition with her real family in Korea . Years after, Joon-suh returned to Korea and by chance the two former siblings were reunited. Meron ngang mga Kdrama na traggic ang ending. At xempre hopeless romantic ako so dun ako sa mejo dramedy at kahit papano, happy ending. Endless love series are my favorites. I even bought my own cds before - No DVD copy yet that time. I love the face of Jenny... so innocent and lovely!